Not sure how this depicts The Fool? Click here. Etteilla: Folly, Insanity, Delirium, Frenzy, Crazy, Innocent, Without Affectation, Simpleton, Exhaustion, Nothingness. Lévi: The Fool, wondering without aim, is burdened with a wallet, full, no doubt, of his follies and vices; his disordered clothes discover his shame. Christian: You can see in this Arcanum a blind man carrying a full beggars wallet. This blind man is the symbol of he who makes himself the slave of material things. His wallet is packed with his errors and his faults. Papus: A careless-looking man, wearing a fools cap, with torn clothes and a bundle upon his shoulder. This is an image of the state to which unresisted passion reduces a man. It is the symbol of the Flesh and of its gratification. Felkin: In the Golden Dawn pack, an effort is made to reveal the deeper meaning of this card. 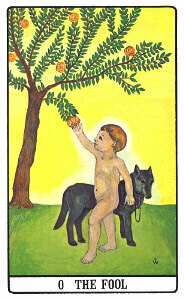 A naked child stands beneath a rose-tree bearing yellow rosesthe golden Rose of Joy as well as the Rose of Silence. While reaching up to the Roses, he yet holds in leash a grey wolf, worldly wisdom held in check by perfect innoncence. Ilustration (right): The Fool from The Golden Dawn Tarot Deck by Robert Wang (copyright &COPY; 1978 U.S. Games Systems). Click the image for a larger one. Waite: A young man in gorgeous vestments, the Fool, pauses at the brink of a precipice among the great heights of the world. The edge which opens on the depth has no terror; it is as if angels were waiting to uphold him, if it came about that he leaped from the height. His countenance is full of intelligence and expectant dream. Wirth: This Arcanums symbolic value is equivalent to zero, for the Fool is the person who does not count because of his lack of intellectual and moral existence. Insentient and irresponsible, he drags himself through life as a passive being who does not now where he is going and is led by irrational impulses. 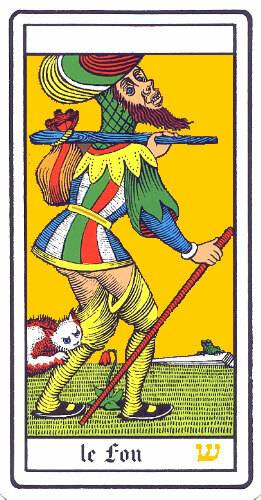 Illustration (left): The Fool from the Oswald Wirth Tarot Deck, adapted from the work of Wirth (1889) (copyright &COPY; 1976 U.S. Games Systems). Click the image for a larger one. Crowley: The really important feature of this card is that its number should be 0. It represents therefore the Negative above the Tree of Life, the source of all things. It is Qabalistic Zero. It is the equation of the Universe, the initial and final blance of the opposites; Air, in this card, therefore quintessentially means a vacuum. Gray: The subject of the reading faces a choice in lifea choice of vital importance to him. Therefore he must be careful to use all his powers to make the right choice. Sadhu: Perhaps inner contradictions are torturing the Fool, preventing him from a reasonable use of his incarnation. If so, is he not some kind of reflection of ourselves? Yes, he is! In him is depicted the tragedy of the family of beings called human, which inhabit this planet. One will need much courage, impartiality and a clear, all-embracing insight in order to accept this fact as it is. ONeill: First and foremost, the Fool is the base of the Neoplatonic hierarchy: man in his misery, without spiritual meaning. He is the symbol of the spirit trapped in matter. He is the dumb ox, the unawakened man. He is also the redeemed initiate, returning to society to save others. His lack of concern for the world around him is not due to ignorance but to wisdom. He realizes his divine nature and is unconcerned about the material universe. Pollack: The Fool represents true innocence, a kind of perfect joy and freedom, a feeling of being one with the spirit of life at all times. An older tradition pictures this archetype as a grotesque wanderer. This image has been interpreted variously as the soul before enlightenment, a newborn child entering the world of experience and the principle of anarchy. Symbol (above): It is best viewed sideways and depicts a man wearing a fools cap. Note goofy smile and bug eyes.